Spectacular space: The most stunning, mind-boggling photos & videos of 2014! It was a year of amazing discoveries and historic missions; selfies on Mars, looking into the eye of a typhoon, and the first Vines made from space. But it was also a year of sadness, as the war in Gaza reached the skies – while some rockets did not. European Space Agency (ESA) astronaut and social media celebrity Alexander Gerst has made a special Christmas gift for all space lovers. After he returned from a six-month mission on the International Space Station (ISS), Gerst combined thousands of photos he took during his adventure into one the six-minute video capturing the drama and beauty of planet Earth. Earlier, Gerst posted what he referred to as the “saddest photo yet” - the Gaza war zone from space. One can clearly see the yellowish glow of exploding targets. Meanwhile, Vines reached space and went back to Earth in 2014. Living on the ISS in low-Earth orbit, NASA astronaut Reid Wiseman has been satisfying the curiosity of his subscribers by posting space timelapses. One of them shows the greenish white ribbons of the aurora borealis– also known as the Northern Lights – haloing our planet. NASA took a major step in its journey to Mars in December, as the Orion Multi-Purpose Crew Vehicle completed its first voyage to space. After the test flight, the agency released a 10-minute video giving a glance of what an astronaut sees from a spacecraft as it rushes through our planet’s atmosphere. The fantastic decade-long mission of the ESA’s Rosetta robotic space probe, chasing Comet 67P/Churyumov-Gerasimenko, culminated in mid-November, as the Philae robotic lander detached from its mothership and made the first comet landing in history. Also this year, scientists captured images showing the birth of amazing heavenly bodies around a star some 450 light years away. 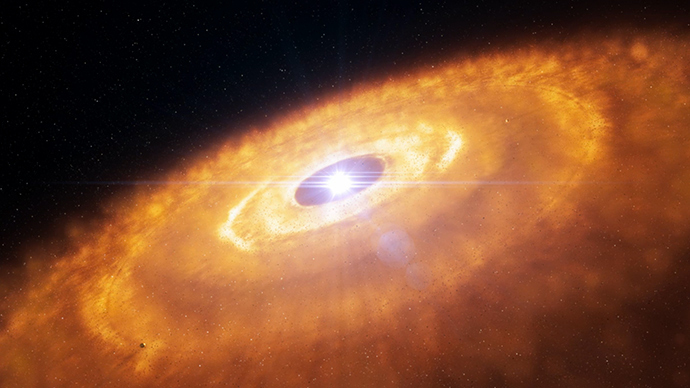 The Atacama Large Millimeter/sub-millimeter Array (ALMA) in Chile shot footage of revolutionary planet formation around the young star HL Tau, with a clarity previously unknown in human history. NASA published a time-lapse video demonstrating the ISS passing over the most intense storm of the year - Typhoon Vongfong, which struck Japan, the Philippines, and Taiwan as a large tropical system in October. The year 2014 marked the first full Martian year (687 Earth days) of NASA’s Curiosity rover, which was tasked with finding out whether the red planet’s environment has ever offered conditions to support life. That was some selfie, you cheeky rover! NASA succeeded in taking an incredible portrait of the burning heart of our solar system, where its active regions combined to make it look like a Halloween pumpkin in October. But despite so many successes, this year saw two big launches come out as total disasters for international space programs. Russia’s Proton-M rocket with an advanced satellite launched from Kazakhstan’s Baikonur cosmodrome on May 16. But roughly nine minutes into the launch, it careered off course, forcing its emergency engine shutdown system to kick in. Just moments away from orbit, the rocket traced an arc in the sky and began its unplanned descent. Following this, the US Orbital Sciences Corp. Antares rocket erupted in a massive fireball over the coast of Virginia while making its fifth venture into space on May 28. The explosion obliterated a Cygnus cargo ship on board. Next year, space is expected to get more crowded. India is planning a mission to Venus by May 2015, to study the planet's atmosphere. It is also planning a trip to the Sun. China also has a very ambitious space program. A special project called the 'One Year Crew' will be launched between Russia and the US on the ISS. NASA astronaut Scott Kelly and Russian Federal Space Agency (Roscosmos) cosmonaut Mikhail Kornienko will be stationed on the ISS for an entire year, to study the risks of long-duration spaceflights.